MCR Safety has you covered when in need of foot protection. 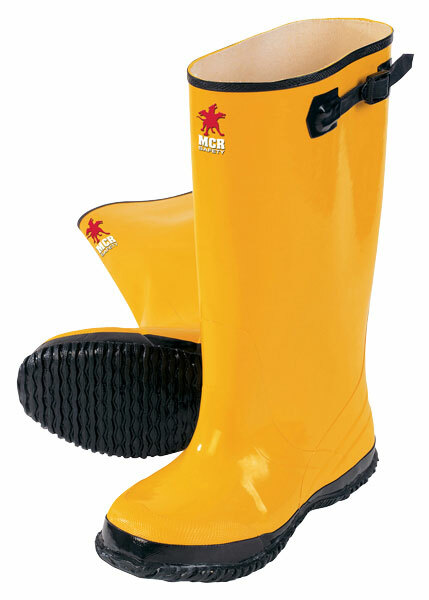 The BYR100 is a yellow rubber slush boot with plain toe. It features a cleated ripple sole for grip, is non-conductive, and has an adjustable strap at the top. It features a cotton material lining on the inside for easy on and off and is 100% waterproof. This boot is an over the shoes option. Order 2 - 3 sizes larger than shoe size. Sizes 6-18 available. Wear over the shoe. Order 2 to 3 sizes above shoe size.